Meet Alexandria Ocasio-Cortez, the latest star of the Democrat Party. She is the front-runner for New York’s 14th District, which covers varies neighborhoods in the borough of Queens and The Bronx. What makes her so special? She has no prior political experience; not much professional experience as far as I can find; she was also virtually unknown, as here rankings in the polls would suggest. Yet, she managed to defeat 10 term Democratic House Representative Joe Crowley, who is (or was) considered the third-ranking Democrat in Congress (behind Nancy Pelosi). She is also a devout Democratic Socialist, so this evidence that socialism is making a breakthrough in American politics, right? Has the progressive-wing of the Democrat Party become successful in reforming the party in their image? Well, not so fast. Ocasio-Cortez managed to win the primary election with barely 16,000 votes in a district that already swings heavily Democrat. In a district with roughly 195,000 active eligible voters, she only received 8 percent of the vote during the primary. New York has one of the lowest voter turnouts in the nation. After all, why bother to vote in a state that only votes Democrats into office. However, one can argue that Ocasio-Cortez was able to find a path that involved getting people to physically vote, rather than estimating the likely voters. Genius campaign strategy or just plain dumb luck? I’ll leave that up for debate. However, what is not debatable is how we measure economic statistics. Normally, I don’t expect politicians and pundits to know a thing about economics, even if their background is in economics. That was until I saw this tweet. Having an undergraduate degree in economics isn’t really a credential, per say. It’s like someone bragging that they were a biology major; it doesn’t necessarily make one a Doctor. An expert in Economics wouldn’t brag about earning 30 credits during their undergrad. They would either have a body of work they could point to in the private-sector or they would have a Ph.D./Masters. Is Ocasio-Cortez assuming that she knows something that her future colleagues do not? Anyone who has bothered to look up anything on income inequality knows what a Gini-coefficient is. It’s really not that difficult of a concept to understand. She is letting all her newfound fame get to her head. She better hope someone better not find one error she has done. It didn’t take us long to find that error. This is a classic example of the Dunning-Kruger Effect. Put simply, the Dunning-Kruger Effect stipulates that the more uninformed or uneducated a person is about a particular subject, the more a person will mistakenly assess their intelligence as greater than it is about that subject. She has not only over-estimated her abilities, she appears to have a difficult time demonstrating the depth of her knowledge. One can say, in her defense, Ocasio-Cortez has never been put in a situation where her ideas were challenged. The problem with ideologues (Ocasio-Cortez does indeed fit the description of an ideologue for our purposes) is not the opinions that they hold. The problem is that ideologues don’t test their ideas against reality and they won’t adjust their ideas based on reality. So when you listen to Ocasio-Cortez’s first claim, “the Unemployment rate is low because everybody has two jobs”, it sounds ridiculous at face value; even to people outside the realm of economics. In her worldview, the unemployment rate isn’t falling due to natural causes of a shrinking unemployment rate (which can either be a growing labor force or people moving from unemployed to employed). The unemployment rate is falling simply because of people have to work two jobs just to make ends meet. I’ve already mentioned before, the Current Employment Survey (CES) counts one person holding two jobs has two different jobholders, while the Current Population Survey (CPS) counts the same holding multiple jobs as one person. There is no way someone who understands Gini-coefficients would screw this up. I’ve also written extensively about multiple jobholders, and it is a serious problem. However, the percentage of people who work multiple jobs as a percentage of the overall employed population is low and has been low since we’ve started reporting these statistics in 1996. Her second claim, “unemployment is low because people are working 60, 70, 80 hours a week and can barely feed their kids.” Unfortunately, Margaret Hoover (host of the Firing Line) didn’t ask her to elaborate on this, but this is equally ridiculous. Compared to the 1960’s and 70’s, Americans are working fewer hours than ever before. This is mostly due to the fact that Americans are more productive than ever before. Working 40 or more hours a week was a common thing, once upon a time. Recently, the average amount of hours most employees can expect to work are between 34 and 35 hours. This can also be disproven by looking at the breakdown of average weekly hours by industry. It’s rather uncommon for someone to be in a line of work where they are expected to be working so many hours without earning any meaningful compensation. These are fields that tend to be highly inflexible, such as financial services, healthcare, and business management. Granted, there are people who do work 70+ a week with families, and that is unfortunate. However, it’s unlikely that people are willing to work so many hours without having time to take care of their families. This claim doesn’t hold any water. Her final claim, “Capitalism has not always existed in the world, and it will not always exist in the world.” That’s debatable. One can argue that eventually, capitalism will become so unsustainable that the public will demand a new system to replace it. Compared to human history, Capitalism is a relatively young economic system. Before that, there was abject poverty and misery around the world. Unlike today, there are very few examples of lower-class individuals protesting their economic plights. This is because most people were poor; they were born poor, they lived their entire lives poor, they died poor. 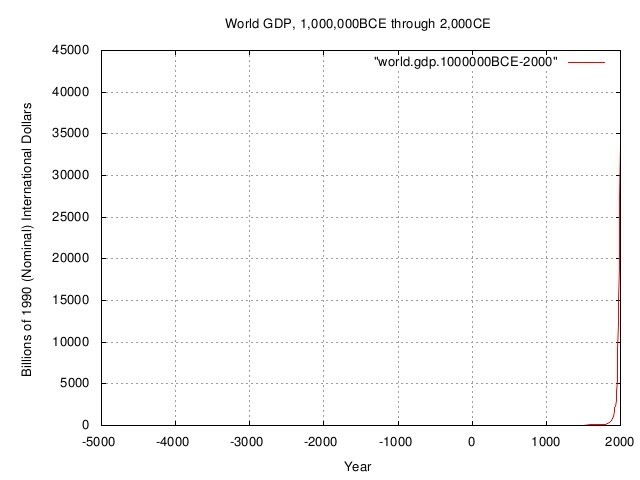 As you can see in the graph above, that all changed with the industrial revolution and the increasing of living standards throughout the world. Most attempts to transition from a market-oriented economy to a classless state-owned economy have failed, collapsed or simply reverted back to market-oriented economies. As we’ve stated before, we don’t expect politicians to know very much about economics. Very few people in mentally-demanding, high-driven fields leave the private sector to become a public official. Her future constituents and her party seem to love her; she has a very good background that is indicative of the American Dream. It was only a few weeks ago that she was a waitress in a bar, hustling for tips. Now she is likely heading to Capitol Hill. The media has elevated her on cloud nine, near the same level as the Gods. However, the sooner Alexandria Ocasio-Cortez learns a little bit of humility, the better. It’s only a matter of time before the Dunning-Kruger Effect lands her into big trouble, then everyone will discover that she is a mere mortal like the rest of us.